The victory also guaranteed Manchester United a spot in the round of 16 with one game to spare. However, things could have been very different had it not been for their talismanic goalkeeper David de Gea who pulled off a miraculous save on the 70th minute to prevent the visitors from going ahead. And his effort was duly recognized by Mourinho who said, “Without David’s save, no winning goal either”. “He’s in such a strong position to negotiate of course. “I think United will be delighted that Courtois signed for Real Madrid because they’ve got a young goalkeeper there. Can you justify paying top dollar for De Gea when you’ve got him? Possibly not. “That limits the options because let’s get it right, where can he go? Where’s bigger than Manchester United? “He is a world-class goalkeeper, probably the best in the world That’s exactly what you need if you want to be a big club that wins things. Manchester united should do everything in their power to keep de Gea at the club because it might be literally impossible for them to find a replacement. Arsenal on the verge of making the first summer signing. Real Madrid in advance talks to sign Barcelona target! 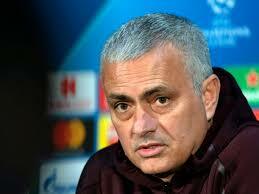 Jose Mourinho delivers his opinion on Manchester United’s performance against Barcelona!